People use baseboard heaters when the space they want to heat up is relatively small or when they do not wish to install a full central heating system. Among fixed space heaters, baseboard models enjoy a fair bit of popularity nowadays as more and more people find themselves renting rather than owning. What’s more, baseboard heaters are very safe to use, easy to install, and guaranteed to deliver a reasonable standard of heating. With that in mind, let us delve into what the market has to offer in our quest to find out what are the ten best baseboard heaters out there and what stand-out characteristics we should look for when buying one. The King Electric KPH1210 Portable Baseboard Heater is a premium quality 3-foot device that comes equipped with an inbuilt thermostat to control heat output and comfort levels. Featuring a finned crushproof element made from high-end aluminum, it comes uniquely constructed with a full-length cutout for safety. Offering efficient convection heat, this device is noise-free and backed up by 1,000 watts of sheer power. Including a handle on the back of the heater, its ingenious design makes it easier to carry around when needed. Equipped with 5 variable heat settings, the NewAir AH-600 1500W Ultramodern Baseboard Heater aims at providing maximum comfort and relaxation. Featuring an easy to operate temperature control system, it comes with a 7.5-hour timer that automatically shuts down the device as per your input. With the ability to heat up to 150 square feet of space around the device, it also includes an automatic shut off function that turns off the heater if the unit experiences overheating. Made with heavy-duty, durable materials, this baseboard heater features a simple design that is ideal for small spaces. Featuring an inbuilt thermostat, the Dimplex North America 1,000W 30″ Wireless Heater is an energy efficient device that keeps the room at an even temperature, ensuring maximum comfort is achieved. Measuring 30 inches by 2.4 inches by 6.6 inches, this device is space efficient and can be mounted onto a wall with ease. Providing up to 33% energy savings, it is designed with a special polyester powder coating that is eco-friendly and is resistant to fading. Easy to install and operate, this device is durable, convenient, and extremely efficient. Designed in a clean, modern style with an elegant off-white finish, the Fahrenheat PLF754 Hydronic Baseboard Heater is a high-quality device that is known for its performance. Including a heavy-duty heating element that is completely immersed into a heat transfer liquid, this heater omits warmth at different levels, keeping you comfortable and snug. Designed to mount onto any tile, flooring or carpet, it comes with a wire way at the back of the heater for easy connectivity. Thanks to the special thermal cutouts, it automatically shuts off the heater if it experiences any air blockage and turns it on when back to normal. 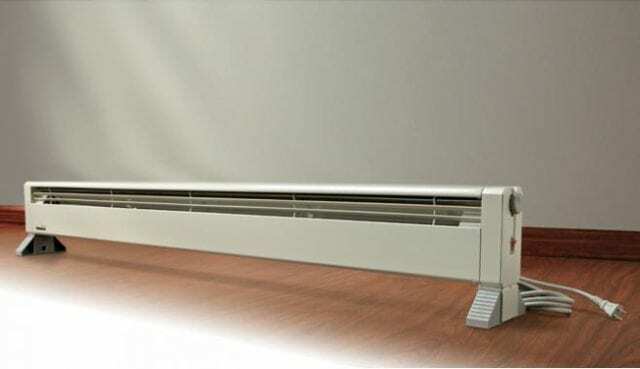 Featuring a back wire construction and design, the King Electric 2K1205BW K Baseboard Heater is a premium grade, efficient and durable device that is crafted to provide long-lasting heat over long periods of time. Ideal for apartments and smaller properties, this reliable heater comes equipped with inbuilt clamps and a crushproof element that helps to generate heat efficiently. Designed with a classy baked enamel finish, it is made with high-quality materials including high-end components and elements that ensure optimum durability. The Fahrenheat PLF504 Electric Hydronic Baseboard is a heavy-duty heating device that is durable, efficient and noise free. Thanks to its special hydronic fanless mechanism, it prevents dust and other particles from circulating, keeping allergens and dander from moving around the room. When the air intake is blocked, the device automatically shuts off owing to its unique overheating protection function. Measuring 24 inches in length, this hard-wired heater is backed up by 500 watts of power and is easy to install and connect, thanks to its inbuilt cable clamp. Designed to transmit consistent heat, the Cadet Manufacturing 09956 240-Volt White Baseboard Hardwire Electric Zone Heater ensures you will always be warm and snug while indoors. Featuring a 25-gauge steel sheet with a 20-gauge junction box, this device comes with a heavy-duty metal casing that is powder coated with a sleek outlook. Measuring 72 inches in size, it is backed up by 1,500 watts of power and is ultra-durable as well as reliable. 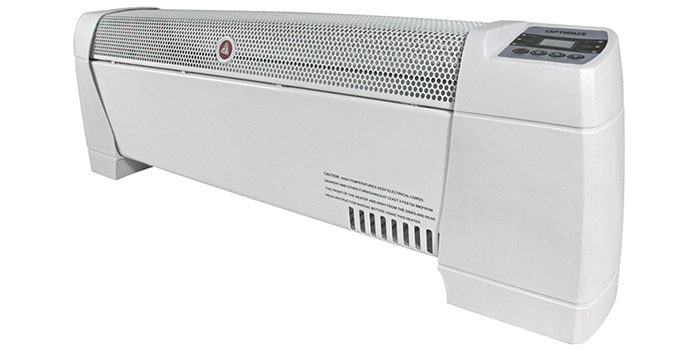 With no assembly or set-up required, the Comfort Zone Heater Convection Baseboard automatically turns on when connected to any power source. Backed up by 2 variable heat settings including a 750-watt and 1,500-watt setting, it comes equipped with an overheating protection system that automatically shuts the device off when the temperature rises above normal. It also comes with a safety switch that shuts off the device if tipped over. Thanks to its heavy duty gauge heating sheet, it provides evenly distributed heat that offers silent warmth and comfort. Uniquely crafted with an inbuilt thermostat and a digital display, the Optimus H-3603 30-Inch Baseboard Convection Heater comes equipped with 2 heat settings to choose from. Featuring an automatic control of the thermostat, it limits the amount of heat and provides a mortification if any overheating is experienced. It also comes with a safety tip-over switch that shuts off the device if tipped over. Made with a heavy-duty metal casing with a heavy gauge sheet, it comes with a carrying handle that makes it convenient to move around. Known for its premium quality, high performance, and favorable reviews, the White Baseboard Hardwire Electric Zone Heater provides a convection heating system that helps in proper air circulation while heating up an area of up to 125 square feet. Noise-free, durable, and highly convenient, the device is ideal for bedroom utilization as well as for office spaces. Thanks to the heavy-duty powder coating on the exterior of the heater, it offers a smooth finish that is scratch-proof, fade-proof and resistant to corrosion. It also includes a special safety feature that turns off the heater when the temperature crosses normal levels. Not just that but it also benefits from a 25-gauge steel construction and requires a thermostat to function as it is not a plug-in device.